The cold air is back in place and has some staying power over the next 7 days as the pattern favors below seasonable temps. In fact, much of the forecast will run 10 degrees below average, allowing for a more early January feel than December. With that said, the pattern also features plenty of dry air, finally giving us a reprieve from the stormy pattern we had this Fall that seemed to bring a major soaker every few days. The warmest day is tomorrow, as highs nudge 40. 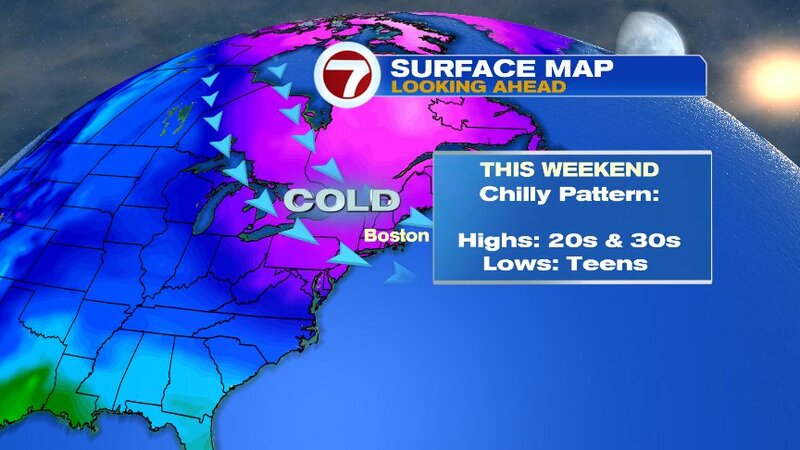 A reinforcing shot of cold air moves in by this weekend with a cold breeze developing Friday into Saturday. Highs struggle to get our of the 20s Saturday, with wind chills in the teens. The cold nights ahead will also help those backyard skating rinks any of you have framed up, to freeze solid. Additionally, that cold, dry air that moves in this weekend will also help suppress a major storm to our south, at least through Sunday. By Monday and into early Tuesday, if that high retreats fast enough, we could get clipped by that coastal storm, but right now, odds favor against that. Something to certainly keep an eye on though.